Starting March 2005, The Roughneck Riot hailed as Manchester’s most energetic, raucous and messy punk bands – with a sound that could turn holy water to piss. Taking influences from bands such as The Pogues, The Clash, Johnny Cash and Social Distortion, the bands sound evolved into the whiskey soaked, Guinness fuelled, neighbour disturbing collection of songs that you cant help but party to! 2009 saw a line-up change and The Roughneck Riot progress from the 4 piece bunch of teenage guys to the 6 piece orchestra of twisted celtic punk rockers you see today. Since that point the band have taken the UK by storm, with none-stop gigs up and down the country, two European tours & support slots for acts such as: The Mahones, The Real McKenzies, Sham 69, Demented are Go, Street Dogs, Shane MacGowan and other underground artists. 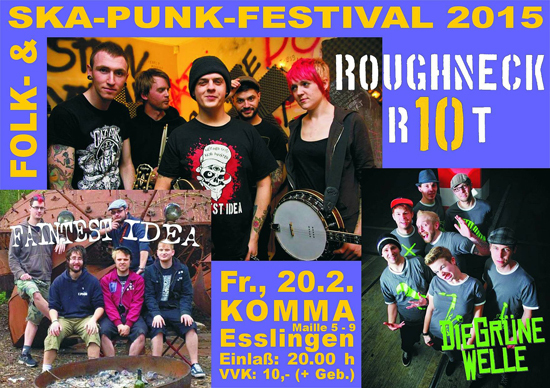 With their début album under their belt, and having just released their new E.P ‘Same Again Tomorrow’, The Roughneck Riot are set for the rest of 2011 with UK, Ireland & European tours and festivals and support slots for The Creepshow, Street Dogs, Hooligan and Monica and the Explosion, Talco and The Buccaneers. Faintest Idea are a fast explosive punk and two tone ska band with deep, hard hitting dual vocals and addictive brass. From there energetic live performance, its no suprise they have an ever growing army of loyal fans. Mixing an exciting concoction of their influences – The Filaments, Rancid, Inner terrestrials,The specials,Toots and the Maytales etc; this band has its own sonic blast punk injected sound that is to rare to comprehend on its own!